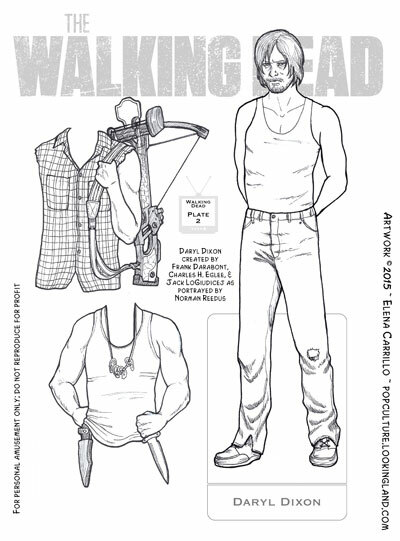 Of all the characters in The Walking Dead, drawing Daryl’s given me the most overall fits (and that’s saying something given how much trouble Rick was). I had to draw his head three times before I settled (once again), but I had to draw his body three times too. And then there’s the matter of that crossbow. I drew two different pieces with the bow (only one of which is on this plate). Let me just say I don’t ever want to have to draw another crossbow so long as I live, if it can be helped. Both of the pieces I included on this plate are early costumes before the vest became ubiquitous–but don’t worry, I’ll include that too on a subsequent plate. I also tried to give him a sort of middle-ground hairstyle between the short crop he had at the beginning of the series and the crazy long greasy thing he’s got going on nowadays. The first two versions both showed his ears, but neither of them looked right–I just couldn’t get it to work, so I had to cover them. 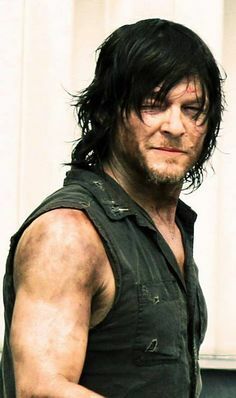 I do like Daryl as a character, though he kinda hasn’t had anything interesting to do on the show for a while and there’s rampant speculation that he’s on the chopping block to be killed. As he’s not a character from the original comic book source, he’s a bit of a wild card, but he’s also a fan-favorite, so I’m interested to see which way he goes. Daryl, The Walking Dead. Bookmark.